Of course, if you are creating a new account, the window will be entirely empty (and the title of the window changes to "Add New Account"). You can also get to this window, empty for creating a new account, by selecting the "<Add New>" option from an Account drop-down list in a Register, Register Splits, Journal Entry or other special-purpose data entry window. The Type field lists various sub-classifications of asset and liability accounts that you may group those accounts into, as well as options for Fund, Revenue or Income. (You can control exactly what some of those are called with the Maintenance ⇒ Entity Names window.) You must make a selection from this field. While you can change the Type of an existing account that has transactions entered for it to another one within the same asset class, you cannot change it to be a different asset class. You also cannot change the Type of an account that either is a sub-account, or has sub-accounts, because that would separate it from its parent account or sub-accounts! The Number field is for the account number for this account. Please see Accounting Concepts for the ranges of account numbers for each class of accounts. You may safely change the Number of an account, as long as it is still within the correct range and does not duplicate another number, without affecting any transactions that have already been entered for that account. Why do I have to use account numbers? Throughout most of the program, you don't, and you can turn off the display of account numbers in most places by using an option on the Maintenance ⇒ Main Options window. But when you are defining your chart of accounts, it's the easiest way to define the order you want your accounts to appear in, for lists, reports etc. Accounts at the top level will always be in numerical order, with their sub-accounts listed under them, also in numerical order, and the same for sub-sub-accounts. The See Existing Accounts button to the right of the Number field expands this window and opens up a scrolling list of all accounts that exist so far, at the right side of the window. It is just for your reference, to help you select account numbers for new accounts (or change existing ones). By clicking this button, you can see what account numbers you already have of the same Type, and find unused account numbers. Any account names that show up in italics on this list are hidden accounts. The Name field is the main name for this account, that will be displayed in most places in the program. You may safely change the Name of an account without affecting any transactions that have already been entered for that account. The Description is an optional further description of this account, mostly for your information when looking at this window. The Level is used when building a hierarchy of top-level, sub and sub-sub accounts. Note: You can only allocate transactions to accounts that do not have any sub-accounts. However, those could still be top-level, or sub-accounts, as long as they have no sub-accounts of their own. 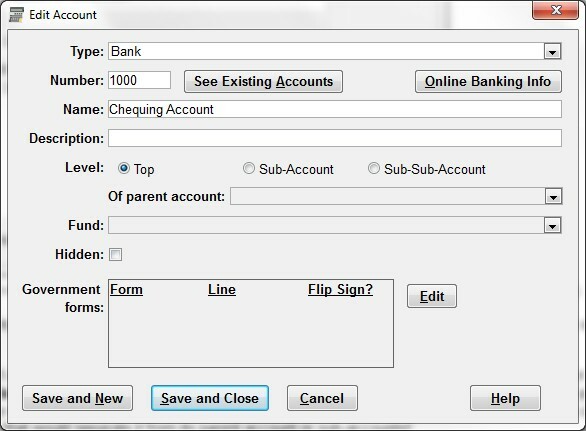 The Of parent account field is only active when you have selected the Level setting "Sub-Account" or "Sub-Sub-Account". If you select "Sub-Account", the parent account drop-down lists all top-level accounts with the same Type. If you select "Sub-Sub-Account", the parent account drop-down lists all sub-accounts with the same Type. You must select a parent account for each sub or sub-sub account. The only account that cannot have sub-accounts is the original General Fund account created when you first initialized your Chart of Accounts. It would have started with that name and account number 3000, though of course you might have changed the name and/or the number since then. The Fund field is only active for Income/Revenue and Expense accounts, and the selection you make there determines which fund's balance any transactions against that account implicitly increase or decrease. Every such account must be associated with a fund account. Only fund accounts with no sub-accounts are listed in the Fund drop-down list. This field defaults to the General Fund. Please see Fund Accounting to understand this fully. Income and Expense accounts that have sub-accounts, and which you therefore cannot directly enter transactions against, also have to be associated with a fund, but it actually doesn't matter what fund you associate them with - any numbers displaying in those accounts in any report are just totals from their sub-accounts. Both the Of parent account field and the Fund field drop their lists down automatically, as soon as you Tab or click into them. They are initially displayed in chart of accounts order, but if you press a letter, they immediately go to the first account that starts with that letter, and also re-sort the list in alphabetical order, to make it easier to see and select other accounts that start with that letter. If you press Backspace after that, or Tab out of the field, the list is returned to chart of accounts order. The Hidden checkbox determines whether or not this account is displayed in drop-down lists of accounts, when you are entering transactions. (If you check Hidden, this account will normally not be displayed, but see below for exceptions.) However, if there are existing transactions for hidden accounts, they will still be displayed on reports (or the reports would not balance correctly!). For accounts with sub-accounts, you can only hide them if all of their sub-accounts are already hidden. The Government Forms table lists any forms, and lines on those forms, that this account forms all or part of the balance in, for reporting purposes. You can make changes to this list with the Edit button, which takes you to the Edit Government Form Lines window. Note: Only accounts with no sub-accounts (the ones you can post transactions to) can have associated Government Form Lines. After entering all of the fields as desired, click Save and New to save the changes and clear this window to allow you to enter another new account. Or you can click Save and Close to save the changes and close the window. Or you can press ESC or click Cancel if you wish to cancel your changes and close the window. As mentioned above, you can only allocate transactions to accounts with no sub-accounts. And you can only associate income and expense accounts to fund accounts with no sub-accounts. Similarly, you can only set up budgets and government form lines for accounts with no sub-accounts. Hidden accounts on lists in the program (such as the Chart of Accounts maintenance window) are generally show in lighter grey text and italics, to make it clear they are hidden. Normally in drop-down lists for selecting accounts, for instance in windows for editing journal entries or register windows, hidden accounts are not included. However, if the current transaction (in a journal entry or register splits window) contains a split row that uses that hidden account, it will be included in the drop-down, but again will be lighter grey and in italics. In prior versions of the program, in the register window itself, if any transaction in that register included a given hidden account, it would be included in the Account field's drop-down for all rows in the register. That behaviour was determined to be a bug, because it displayed hidden accounts long after you had stopped using them, and so it was removed for version 2.01. This button is only active for Bank and Credit Card accounts. Usually you would just click OK on that message!